Do you love Peanut Butter or nut butter? 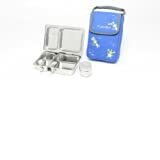 Then this lunch box idea is for you! This is a great power lunch for camp, the pool, a museum outing or work. I kept lunches simple today and even got some unexpected help this morning! 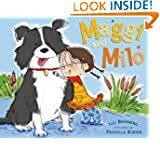 MAGGI AND MILO is the adorable new book written by Juli Brenning and illustrated by Priscilla Burris. Maggi is an excellent adventurer and Milo's best friend. Milo is a Border Collie and very smart. When Maggi's Grandmother sends a package with all the necessities for a frog hunt Maggi and Milo head out almost immediately to find frogs. To find out if they are successful grab a copy of the book from your local library or book store! and of course Maggi and Milo peanut butter sandwiches decorated with dark chocolate. My preschooler loved this book. It has adorable illustrations and the story is just simply fun and sweet. Who would not want to go frog hunting with their best friend? I would recommend this book for any age to read out loud! My daughter loved Maggi and both of them share a love for dogs and rain boots! We especially enjoyed finding all the little frog details in the book and in between highlighted words made reading this book aloud fun for everyone!